All the flavors of your favorite pumpkin pie in a nutrient dense smoothie ready in 5 minutes! 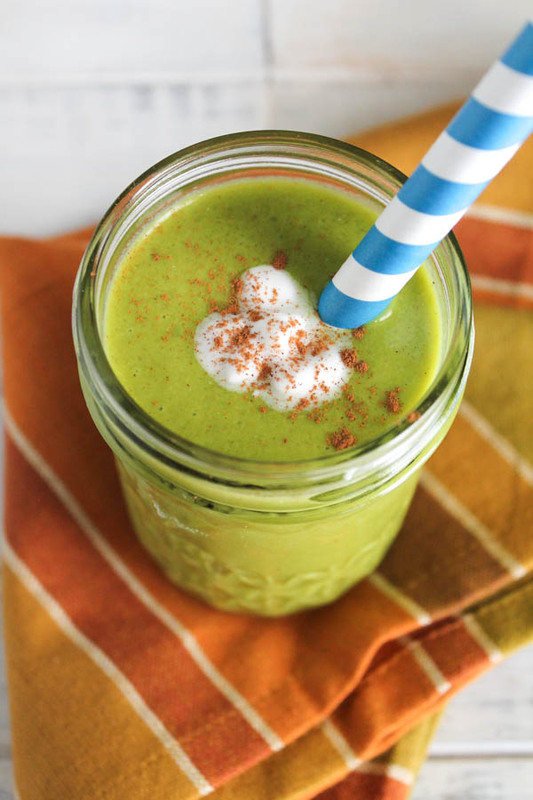 The green pumpkin smoothie is a full meal that will satisfy for hours! With loads of fiber, protein, and good taste, this paleo green pumpkin pie smoothie makes a nutritious breakfast! Fall is always about all variety of winter squash and pumpkin in my kitchen. I grow as many varieties as I can fit in my small yard and stock up at all the local farmer’s markets and pumpkin farms. And why not?!! Pumpkin and winter squash can be incredibly delicious if chosen well and prepared properly. Just like any fruit or vegetable….if you do not pick a good one, the taste can be ho hum…or worse, kind of gross. One of my current favorites is “Sweet Meat”. A huge, dense winter squash that has a lovely sweet flavor and produces a TON of puree for recipes with just one squash (apx 10 cups give or take). You can read my post all about baking your own squash and choosing the bests kinds for eating. TRUST ME. The canned varieties of pumpkin and squash can be strong and bitter tasting and THEY CAN NOT HOLD A CANDLE TO FRESH PUREE!!! I will get off my pumpkin high box now. Promise. This smoothie is nutritious and filling and celebrates the favorite flavor of pumpkin pie. Smoothies are always easily adaptable and flexible. Share your tweaks!! If you want to find other ways to enjoy some pumpkin in your life, be sure to check out some of my over 30 recipes that include pumpkin!! Place all ingredients in order in a high powered blender (I have Blend Tec) and blend until smooth. 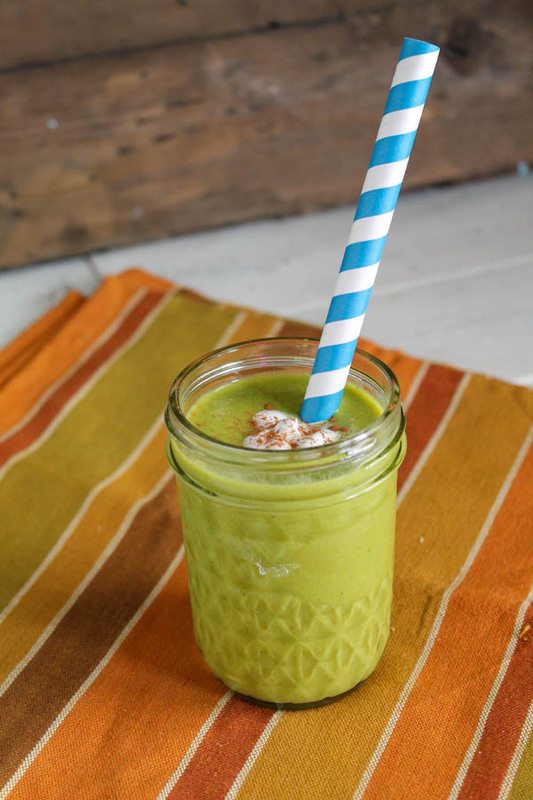 Thanks for sharing this awesome recipe of green pumpkin pie smoothie with us. The use of spinach with pumpkin and ginger has many healthy benefits. It is also high on taste as it includes coconut milk, cinnamon and honey. Hi Tessa. Thanks for the detailed AIP notes on this recipe. I highlighted this smoothie as one of my favorites at this week’s AIP Recipe Roundtable! This year has been the first time that I’ve actually made my own pumpkin puree – canned pumpkin is really hard to source in the UK – and now that I have I don’t think I’ll be able to go back to buying the canned stuff again. You’re right, it’s just sooo much better in every way. Love this recipe – it sounds so filling and delicious! What a great smoothie recipes. Sure is filled with a wealth of health. Thanks for sharing on Real Food Fridays. Pinned & tweeted. This pumpkin smoothie sounds amazing! Such a brilliant idea to make a green smoothie so full of pumpkin cheer! I can’t wait to make this! This is a classic Tessa recipe!!! I love this my friend. And you know we share a love of the sweet pumpkin (and all winter squash). Believe it or not, I’ve never purchased a sweet meet…but now I will!! Yes Amber…you know me and my full meal packed smoothies! !I am having so much fun this year discovering new heirloom varieties of squash and pumpkins to try at the farmer’s market, I have 4 new varieties sitting on my porch waiting to be baked up for a taste test! !